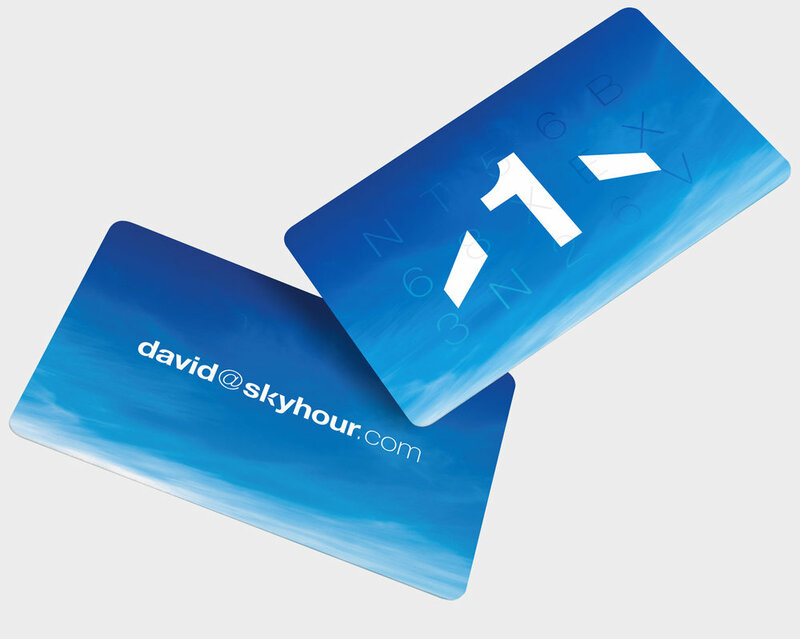 "With a push from JetBlue Technology Ventures to spur global growth and presence in the travel market, Skyhour should become a new favorite among those who want to give a bit more than a Starbucks gift card this holiday season." We have been working with Skyhour since early 2016 to create a new brand from scratch that would breathe new life into the tired old air travel industry. Skyhour allows you to give someone the power and freedom to fly on their airline of choice, on their own terms, through an innovative new flight currency. One skyhour represents exactly one hour of flight time, on any airline, to anywhere. One skyhour is also worth $60; a dollar for every minute spent in the sky. It's a simple and intuitive way of thinking about flying, unlike miles and other flight reward points where the value is entirely arbitrary. We put a twist on the usual business card: when an investor gave the founders an hour of their time, they could now give them a skyhour in return. The brand is a response to the clutter and noise that dominates the travel market. We wanted skyhour to be a breath of fresh air. The wide open skies that run across the brand touchpoints are a metaphor for the freedom of choice that skyhour provides: fly wherever you want, with whatever airline, whenever you want, no restrictions... the sky is yours. We were involved at every step of designing the interface for the iOS app and for web responsive, with Android to follow. Our goal at every step was to remove barriers and avoid clutter. We wanted the experience of using skyhour to be light and easy, to put as little stuff as we could between people, the sky, and their dream destination. There's two sides to every business: what happens behind the scenes, and the outward manifestation that the public sees. With Skyhour we contributed on both fronts - collaborating closely with the founders and developers on product design, but also spending many hours behind the scenes crafting the narrative and design of every Skyhour investor presentation. With the app and website fully functional, and several investors on board (including Jetblue Technology Ventures), Skyhour is now building awareness, gaining traction, and preparing for another round of funding to push growth. Please note the content (words or images) contained within this case study is created by BTL Brands Ltd. The case study sometimes uses artistic impressions of certain aspects of the Skyhour brand. The Skyhour trademark is the property of Skyhour Inc and Skyhour Inc take no legal responsibility for any content featured within this case study.